The Secession Movement in North Carolina was the coalition of forces supporting state separation from the American Union as promulgated by John C. Calhoun of South Carolina. After Calhoun's death in 1850, each new setback for the South within the Union led to an increase of secession sentiment. Certain state leaders, including U.S. senator Thomas L. Clingman, had expressed pro-secession views during the 1856 presidential election, when the Republican Party nominated its first candidate for president. Secession was given its greatest impetus, however, by the election of Abraham Lincoln as U.S. president in 1860. In the 1860 election, Lincoln, the Republican candidate, was not on the North Carolina ballot. The vote was 48,533 for John C. Breckinridge of Kentucky, the southern Democratic choice; 44,039 for John Bell of Tennessee, the Constitutional Union candidate; and 2,690 for Stephen A. Douglas, the regular Democratic nominee. Because Breckinridge supporters backed the Union, the overall vote must be considered evidence of Union sentiment. Nonslaveholding yeoman farmers made up a majority of the North Carolina population and constituted the core of the Unionist strength. They were disinclined to secede or fight for the preservation of slavery. Also, the Whig Party, which had disintegrated as a national party by 1860, still had a strong following. Whig leaders such as Congressman Zebulon B. Vance and former governor and U.S. senator William A. Graham comprised the bulk of the unconditional Unionist leadership, though other Whigs and conservative Democrats such as William W. Holden, editor of the Raleigh-based North Carolina Standard, advocated a "watch and wait" policy while maintaining that secession was a fundamental right of each state. The counties in the west, northeast, and Piedmont were areas of Unionist sentiment. Democrats like Governor John W. Ellis, Senator Clingman, Congressman Thomas Ruffin, and former congressman William S. Ashe led the secessionists. The major secessionist newspaper was the Wilmington Journal, located in slave-heavy New Hanover County. The main areas of secessionist strength were the coastal counties with large slave populations and the counties that bordered South Carolina, especially Mecklenburg. Lincoln's election prompted this group to launch local secession meetings. The first meeting was held in Cleveland County on 12 Nov. 1860, the second in New Hanover on 19 November. A series of similar gatherings were held across the state. The movement was given a boost by the secession of South Carolina on 20 Dec. 1860. To counter the secessionist trend, the Unionists held meetings of their own. Holden's Standard effectively espoused the Union cause, expressing hope of compromise despite the departure of the Deep South states. On 29 Jan. 1861 the General Assembly agreed to put the convention question to the people on 28 February. The legislature also voted to send delegates to the Washington Peace Conference on 4 February. The convention campaign was vigorously waged. The Unionists were able to set the terms of the debate early, focusing on the question of "Union or Disunion." Secessionist attempts to redefine the campaign based on southern selfdefense failed. To the charge that disunion meant war, A. W. Venable of Granville County declared that he would "wipe up every drop of blood shed in the war with this handkerchief of mine." The Unionists carried the northeastern counties and most of the Piedmont and Mountains. They defeated the secessionists by a vote of 47,323 to 46,672. Because a few Unionists, including Vance, supported the convention call, the delegate elections are more indicative of actual sentiment. Only about a third of the 120 delegates elected were secessionists. The Unionists were helped by positive news from the Peace Conference the day before the election. The debate in the campaign had been injurious to the secessionist cause. On 4 March, a few days after the vote, Lincoln gave his inaugural address, which struck some as conciliatory. The secessionists did not give up, however. On 22-23 Mar. 1861 delegates from 25 counties assembled in Goldsboro and organized the Southern Rights Party. They urged the legislature to call a convention and demanded that the state join the Confederacy. They posed the new debate in terms of South against North. Despite numerous meetings, by early April North Carolina seemed no nearer to secession than it had been in February. Then came the news that Confederate forces had bombarded Fort Sumter in Charleston Harbor on 12 April, followed on 15 April by Lincoln's call for 75,000 troops. Governor Ellis responded, "You can get no troops from North Carolina." Zebulon Vance was pleading for the Union with his arm upraised when word arrived of Lincoln's summons. "When my hand came down from that impassioned gesticulation," he recalled, "it fell slowly and sadly by the side of a secessionist." Ellis called a special session of the legislature for 1 May and immediately ordered the seizure of Federal property. When the General Assembly met, it voted for a delegate election on 13 May to an unrestricted convention to meet in Raleigh on 20 May, the anniversary of the so-called Mecklenburg Declaration of Independence. The campaign for the convention was characterized by resignation rather than enthusiasm. Both Unionists and secessionists spoke of the need to act in the face of northern aggression. The major debate-whether North Carolina should separate based on "the right of revolution," as some Unionists advocated, or on the Calhounian doctrine of secession-was over. The radical secessionists favored the latter position. A total of 122 Democratic and Whig delegates, 108 of whom were native North Carolinians, gathered on 20 May 1861. The delegates held an average of 30.5 slaves each, with the median being 21, which meant that over one-half of the delegates belonged to the small planter class. Sixty-eight delegates had attended college, making them far better educated than those who had elected them. The average personal and real property per delegate was valued at $61,817, placing them among the wealthy citizens of the state. The convention elected Weldon N. Edwards, a Democratic planter from Warren County, as president. (Edwards defeated William A. Graham of Orange County.) Edwards gave a speech denouncing continued connection with the "Black Republican Union." Onetime Unionist George E. Badger introduced a resolution for separation from the Union based on the right of revolution. An alternate ordinance, simply dissolving the Union and representing the radical position, was proposed by Burton Craige of Rowan County. The Badger proposal was defeated by a vote of 72 to 40. An attempt to modify the Craige ordinance failed. The convention then unanimously passed the ordinance of secession and voted to accept the provisional Constitution of the Confederate States of America. As requested by Governor Ellis, the convention agreed not to put the secession ordinance to a popular vote. On 21 May 1861 the ordinance was signed and President Jefferson Davis proclaimed North Carolina a Confederate state. The convention represented the high point for the Democratic secessionists, who suffered a major setback one year later when Conservative candidate Zebulon B. Vance was elected governor despite his strong opposition to secession. Kemp P. Battle, "The Secession Convention of 1861," North Carolina Booklet (April 1916). Daniel W. Crofts, Reluctant Confederates: Upper South Unionists in the Secession Crisis (1989). Joseph C. Sitterson, The Secession Movement in North Carolina (1939). 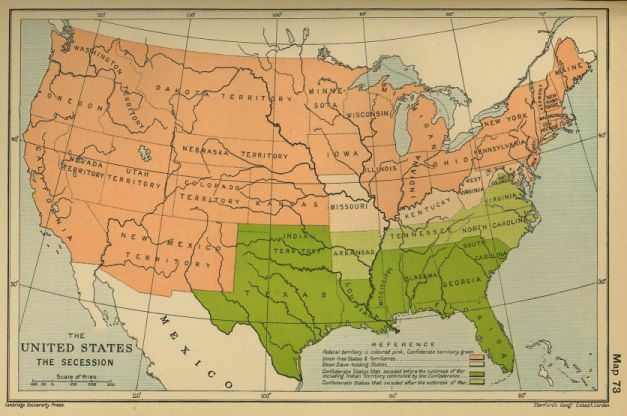 "History map of the United States: The Secession. "University of Texas at Austin. From the Cambridge Modern History Atlas, 1912. Available from http://www.emersonkent.com/map_archive/united_states_secession_1860.htm (accessed May 3, 2012).